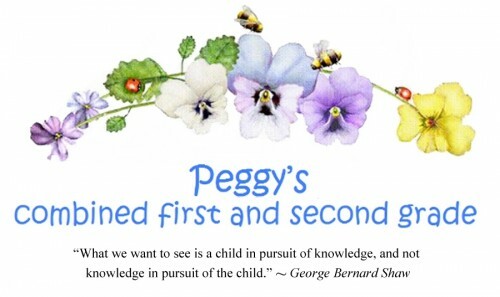 In my combined first and second grade classes, children’s self-initiated learning took place during Choice Time. Much enthusiastic activities took place in the construction area of the Math Center. These concrete experiences serve as a background for gaining new insights and understandings – therefore, opportunities for increasing their cognitive development. Materials supplied for constructing were: 5 small paint buckets, each one ½ full of Cuisenaire Rods; 1 inch wooden colored cubes; dominoes; Base Ten Blocks; and Unifix Cubes. Building all kinds of structures were most popular – buildings, towns, roadways, and towers, supplemented with various other materials such as 1 inch cubes, dominoes, pegboards, etc. There were times when too many structures were knocked down because someone carelessly walked by. So there was an agreed upon class rule that excluded anyone from the math center for a few days if they knocked anything down – even if it was a complete accident. The number of days agreed upon varied with each class, but usually it was two or three days. No blame was attached, and it was amazing how carefully children walked through or by the buildings after that. From then on, there were few accidents. Constructing allows opportunities for developing concepts necessary for good achievement in abstract math. A good math student is able to conserve, recognizing that two amounts are equal even though one is a different shape or size than another – that five Cuisenaire Rods or five rulers are five. Building in the math center, children constantly see various arrangements of numbers of objects. It is also an opportunity for overcoming egocentrism. An egocentric child cannot see or understand another viewpoint. An aid to overcoming this is continually looking at all sides and angles of each structure built. Success in math requires a good mental image of numbers of objects in many different configurations including the various shapes, sizes, and dimensions of these objects. Children must have concrete experiences before they can abstract. While children were constructing, they were constantly sorting and classifying while looking at balance, design, and structure. These were opportunities for developing seriation plus spatial and numerical relationships eventually leading to paper and pencil math, no longer needing objects. “The Bean Game”, a very popular one for my combined first and second grade, reinforced an understanding of counting by 10’s to 100. Four game boards, each in a different color, were made on 9” x 12” oak tag. A tongue depressor is traced around 10 times on each board. To play the game, there were about 50 tongue depressors with 10 beans glued on each one, a pile of beans, and a pair of dice. A child would roll the dice and pick up the number of beans indicated by the sum of the dice. When a player had 10 or more beans, he picked up a 10 bean tongue depressor and placed it on his game card. He then returned 10 of his beans to the pile and kept what was left over to use with the next 10. The winner, of course, was the first one to fill his card. Children measure each other working in pairs – using a ruler and/or a tape measure. If metric measurement is preferred or added, they would use a meter stick and a metric tape measure. Learning the four models of multiplication enables children to fully understand multiplication used in problem solving, various operations, and in everyday life. Array: an equal number of columns and rows. Cross Product: every item in one set of objects combining with each item in another set. Measuring: on a number line of objects, skipping an equal number of times across the line. Mother, for sets: there are 3 bags of candy. There are 6 pieces of candy in each bag. How many pieces of candy are there? Mother, for array: on our cookie tray, we put cookies in 3 rows and 4 columns. How many cookies are we baking? 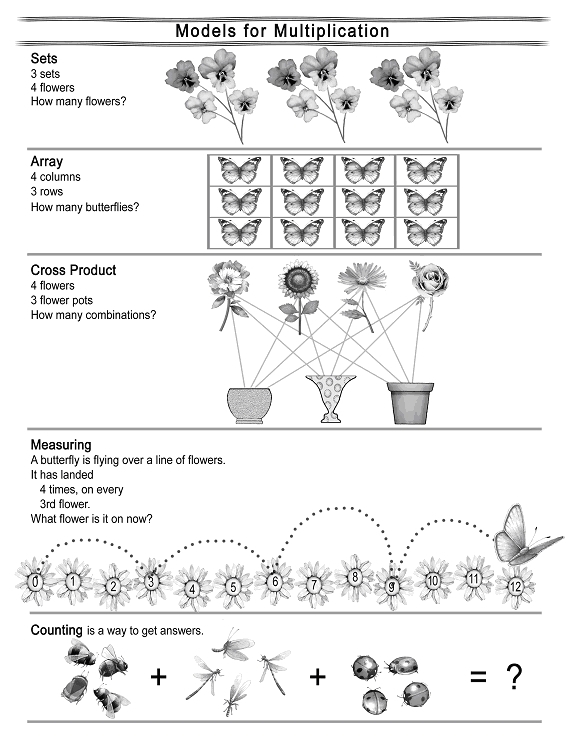 Mother, for cross product: if 4 butterflies landed on each of 3 flowers, how many landings were there? Mother, for measuring: Mary took a walk. On every 3 blocks, she took a drink of water. She drank water 4 times. How far does she walk? Teacher, for sets: we will listen to 5 children read 2 stories each. How many stories will we hear? Teacher, for array: we need 3 rows of chairs with 4 chairs in each row. How many chairs do we need? Teacher, for cross product: Jane has 4 skirts that can go with 3 different blouses. How many outfits does she have? Teacher, for measuring: on a number line, Susan put a marker on every 3rd number, 4 times. What number did she end with? Again, it takes practice for children to answer which model it is. But when children are easily able to give the correct model, they will fully understand the use and purpose for multiplication. 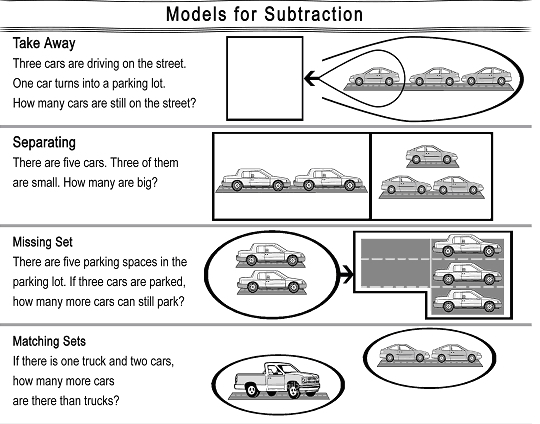 Learning the four models of subtraction enables children to fully understand subtraction used in problem solving, various operations, and in everyday life. Take Away: taking a small set from a large set. Separating: 2 small sets within a larger set. Missing Set: empty spaces in a large set. Mother, for take away: Katie has 5 brothers. Two brothers went outside to play. How many brothers are still in the house? Mother, for separating: There are 6 red and blue balls. Two of them are red. How many are blue? Mother, for missing set: The table is ready for 4 people for dinner. One person is already sitting down. How many more people can sit at the table? Mother, matching sets: There are 3 chickadees and 2 blue jays at our feeder. How many more chickadees than blue jays are at our feeder? Teacher, for take away: There are 20 children in our class. 5 children are going to the library. How many children are left in the class? Teacher, for separating: There are 6 children in the library. 4 of them are girls. How many are boys? Teacher, for missing set: There are 8 chairs at a table. If 5 chairs are occupied, how many more chairs are empty? Teacher, for matching sets: There are 5 children reading and 4 children writing. How many more children are reading than writing? Again, it takes practice for children to answer which model it is. But when children are easily able to give the correct model, they will fully understand the use and purpose for subtraction. 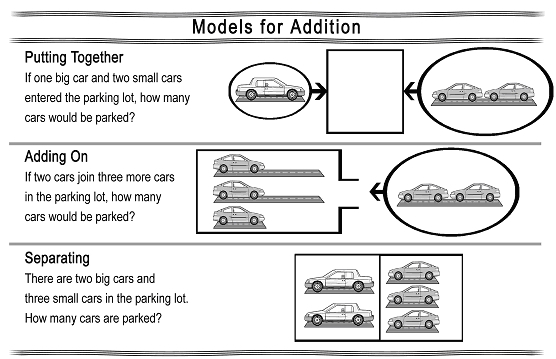 Learning the three models of addition enables children to fully understand addition used in problem solving, various operations, and in everyday life. Putting Together: two separate sets meet in one location. Adding On: one set moves to join another set. Separating: adding together 2 stationary sets. Mother, for putting together: Sam is in his bedroom and Julia is in the living room. Their mother calls both of them to meet her in the kitchen. When they arrive in the kitchen, how many people are there now? Mother, for adding on: Lizzy is by herself in her house. Jane and Tom are playing outside. Lizzy asks them to come inside to play with her. How many children now are playing inside? Mother, for separating: There are two green cars parked on the side of the street. Two red cars are parked in a parking lot. How many cars are parked? Teacher, for putting together: There is a program in the assembly. Mrs. B’s class leaves their room and Mr. F’s class leaves their room and both go to sit in the assembly. How many children are in the assembly? Teacher, for adding on: Our class is in our room and we invited Ms. Green’s class to come and see our play. How many are in our class now? Teacher, for separating: Five children in Mrs. T’s class are wearing red today. Seven children in Ms. Smith’s class are also wearing red. How many children are wearing red? Again, it takes practice for children to answer which model it is. But when children are easily able to give the correct model, they will fully understand the use and purpose for addition.